Insulin is a hormone made by the pancreas that allows your body to use sugar (glucose) from carbohydrates in the food that you eat for energy or to store glucose for future use. It helps keep your blood sugar level from getting too high (hyperglycemia) or too low (hypoglycemia). Insulin injections are used to control blood sugar in people who have type 1 diabetes (a condition in which the body does not make insulin and therefore cannot control the amount of sugar in the blood) or in people who have type 2 diabetes (a condition in which the blood sugar is too high because the body does not produce or use insulin normally) that cannot be controlled with oral medications alone. Insulin Injections are extremely safe provided you follow the right technique in administering them. Diabetics should therefore be aware of guidelines regarding the right way to self-inject insulin. 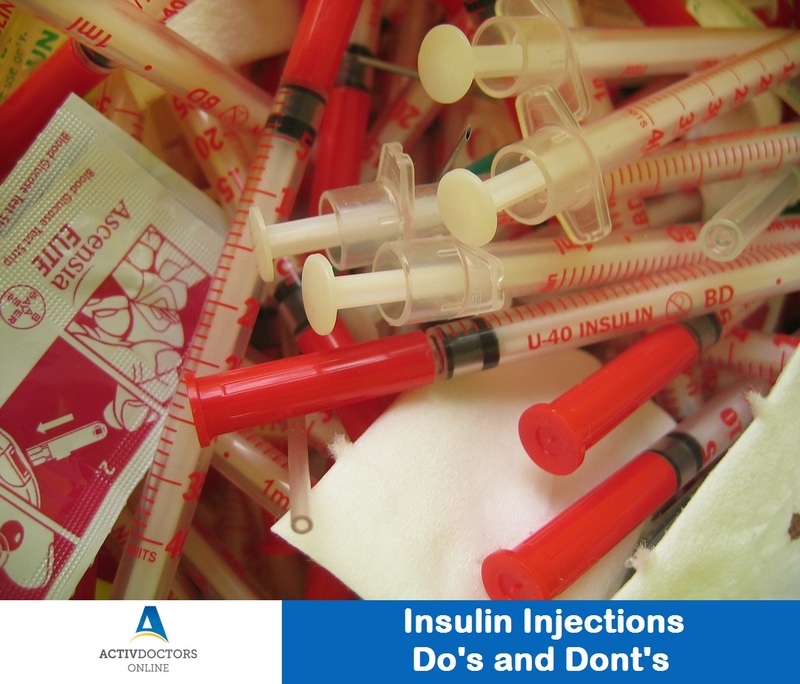 Following are a few Do’s and Don’ts to always remember when using insulin injections. Wash your hands with soap and water every time before you inject. Use different needles each time, although the same syringe can be used. Roll the insulin vial between your 2 palms, so that the insulin mixes well. Keep a note of the site/location where the earlier injection was given, use an area about 2 inches away from this one the next time you inject. Gently pinch a fold of your skin and inject by holding the syringe in a 45-degree angle. Once injected, remember to retract the needle quickly. Remember to not vigorously shake the insulin vial. Do not always inject at the same site. Do not rub the injection site. Do not inject on a mole or scar, it affects the effect of insulin on the body. Do not stop taking insulin injections without your doctor’s permission. Do not take too much or too less insulin, always seek your doctor’s advice if you have any concern or questions. Insulin is a must for diabetics, so that your sugar levels remain under control and does not put your health under complications. Be more than well. Be well prepared. 10 Foods for Flawless Skin!